I'm growing candy in my garden this year, like I do every year. Whenever I'm out working in the garden, I'll be able to walk right over to the candy plants and just help myself. One of the reason I can just help myself is because I never use pesticides on my candy plants. Plus, I have a clean water source nearby so if I think the candy needs a quick rinse before I pop it into my mouth, I can easily do so without walking all the way back to the house. Peas. As soon as I see a pod that looks ready to pick, I'll pull it off the vine, snap it open, and pour the delicious candy, I mean peas, right into my mouth. They are sweet and good, even without cooking. Cherry Tomatoes. Oh yes, cherry tomatoes are premium candy in the garden. Pick and eat. Pick and eat. I like to grow at least one variety of cherry tomatoes with the word "sweet" in it. Then I know it is good candy, though any cherry, grape or currant tomato will be delicious candy and can be eaten right there in the garden. Green beans. 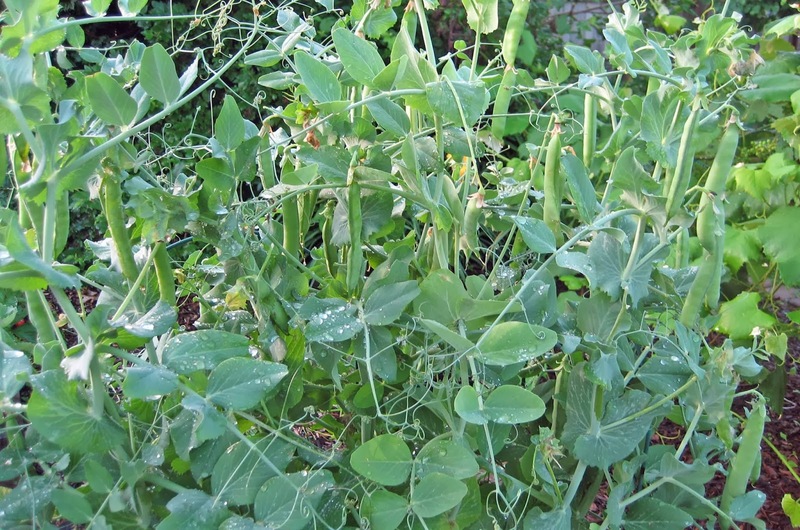 Once the peas are done, the green beans are coming on and they are also good to eat raw in the garden. Cucumbers. Yes, I've picked the tiny cucumbers and eaten them while still in the garden. When they are little and fresh, there is no bitterness in the skins. They are cool and refreshing. Raspberries and strawberries. It is pretty obvious these are garden candy. I grow both red and gold raspberries. Only about half of them ever make it to the kitchen. The other half I eat while still in the garden. With strawberries, I think I eat a third of them in the garden and take the rest to the kitchen. If it looks dirty or dusty rinse it off quick before you eat it. Save some of the garden candy to share with others. Without that evidence, they'll wonder why you can't seem to grow raspberries, strawberries, and anything else you've eaten while still in the garden. I highly recommend growing candy in the garden. It's fun to eat, and fun to share with others. I love that you call them "candy plants." They really are! So excited for spring! Never thought to call them candy plants. Cool! I need me some candy! I do hope to plant some if the ground ever thaws! It won't be long now. I'm planting some of those, too... I love eating in the garden from my vines & plants! Just don't have room for raspberries, which is a bummer! I'm really excited to start my seedlings this week!! Looking forward to seeing your garden grow! I picture you wandering through your garden with cartoon music playing. Remember that cartoon dog that used to float up into the air with joy whenever he got a bone? I like fragrant plants, but I'll have to think of another name instead of the obvious.